fairtrade-melbourne.co.. 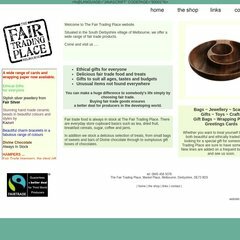 Links and Information from the Fair Trading Place, Your one-stop ..
fairtrade-melbourne.co.. Visit the Fair Trading Place, Your one-stop fairtrade shop ..
Its 2 nameservers are ns2.bpweb.net, and ns1.bpweb.net. Its IP Number is 87.117.239.136. It is hosted by B P Interactive Ltd (England, Newbury,) using Apache web server. PING www. (87.117.239.136) 56(84) bytes of data.